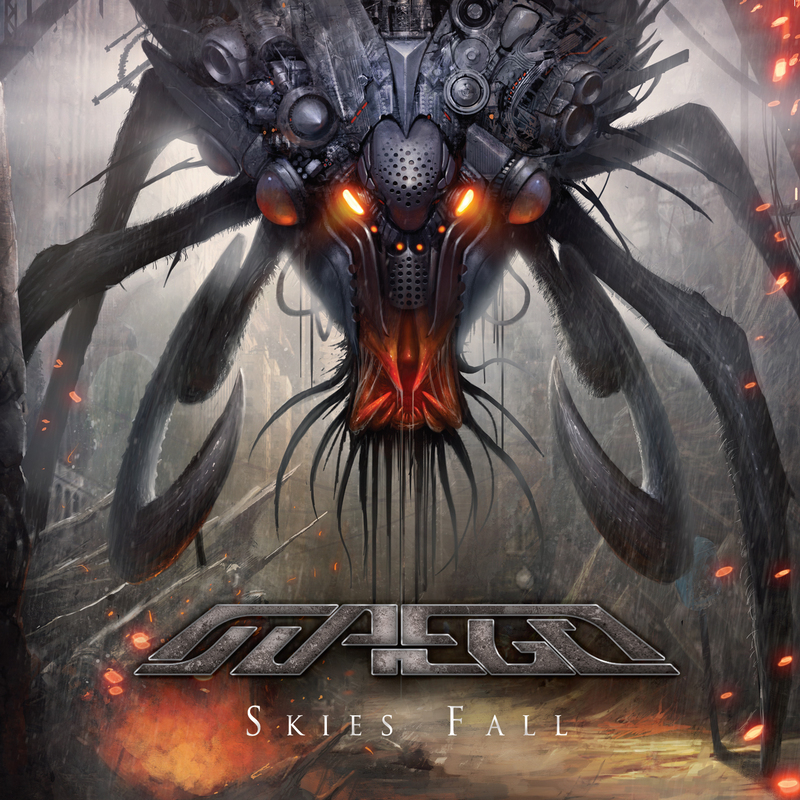 MAEGI’s debut album, “Skies Fall” hosts Hansi Kürsch (Blind Guardian), Chris Boltendahl (Grave Digger), Tim “Ripper” Owens (Judas Priest, Iced Earth, Yngwie Malmsteen, Dio Disciples), Zak Stevens (Savatage, Trans Siberian Orchestra, Circle II Circle) and Jerry Outlaw (Jon Oliva’s Pain) as guests. Maegi itself, is the new power-progressive metal project of Oganalp Canatan(know from Dreamtone, Dreamtone & Iris Mavraki’s Neverland, AFM Records). After working together with Dreamtone and Neverland for about a decade, Canatan has decided to move on with his solo ideas, forming up Maegi and is featuring important names of the scene as well. 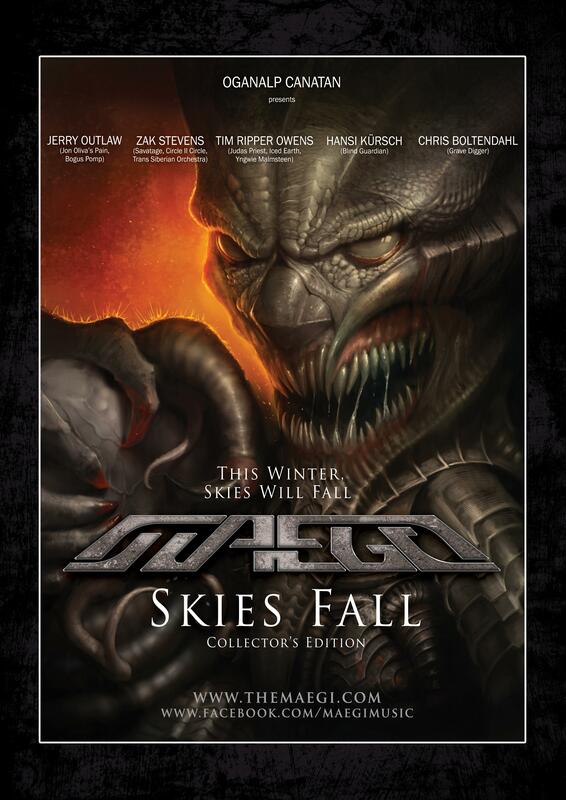 Skies Fall tells the story of an alien invasion on Earth, which eventually ends with the destruction of mankind. The story starts with the unexpected appearance of aliens, of unknown origin, appearing above our skies with “Skies Fall”. All attempts to communicate with the visitors turn out in vain, not being able to create any form of dialogue as we get “No Response” from them. The eventual silence ends up with all communications around the globe going dark and people start to panic. “Communications Breakdown” is followed by “Take No Prisoners” as the aliens start at­tacking on the population without remorse, which turns into a game of “Hide and Seek”, people trying to save their lives. And the eventual destruction and scattering of mankind leaves many scars behind. With “Those We’ve Left Behind”, the grief of those that had to be left behind, dead or alive, is being told. As the story progresses, the remnants of our civilization tries to change the tides for “A Different Fate” and try to form “The Resistance” as a final attempt to get back what is ours. Of course, all is in vain. As the aliens systematically progress their destruction, all hopes go down the drain – “Demise of Hopes”. In the end, all that left are memories and they watch our fall “In Silence”. The story of Maegi’s Skies Fall is written in awe to sci-fi flicks such as The War of the Worlds, Stargate, Mass Effect, Battlestar Galactica. Hints of praise and recognition can be found within the lyrics of songs such as the “All this has happened before, and it will happen again” line of “In Silence”, which is a praise and recognition for Battlestar Galactica, a series that Canatan is a huge fan of, and he carries a tattoo of it on his right forearm. * Skies Fall is featuring 10 tracks. Maegi is being endorsed by Steinberg Media, the creators of Nuendo, Cubase and the legendary VST system. All songs are written and arranged by Oganalp Canatan. The album has been recorded, engineered, mixed and produced by Oganalp Canatan. Mastering done by Ue Nastasi (Lamb of God, Gojira, Biohazard). * The artwork has been created by Yigit Koroglu. * The album will have a regular CD edition and a Collector’s Edition which features extra goodies and a story book inspired by Skies Fall’s theme, approx. 160 pages in length. The story is being written by Prarabdh Thakur and Oganalp Canatan himself. >> The initiator of MAEGI. Oganalp Canatan:The 30 years old singer and composer, Oganalp Canatan, has worked with Dreamtone and Dreamtone & Iris Mavraki’s Neverland (AFM Records) in the past and has released seven albums and singles in between 2002 – 2012. With Dreamtone & Neverland, he has worked with important names from the metal scene such as Hansi Kürsch (Blind Guardian), Jon Oliva (Savatage, Trans Siberian Orchestra), Edu Falaschi (Angra), Tom Englund (Evergrey), Mike Baker (Shadow Gallery), Gary Wehrkamp (Shadow Gallery), Urban breed (Tad Morose, Bloodbound) and more. Oganalp Canatan has shared stage with these names, near to local Turkish acts, in the past as the singer of Dreamtone and Neverland through various tours, festivals and as opening acts. Near to his metal music career, Oganalp has composed and worked on nearly 30 indie game soundtracks. Iris Bernotat iris@focusion.com >> Please send your reviews / news links to be featured on the artist’s website! (Jon Oliva’s Pain, Bogus Pomp, Jerry Outlaw and Friends). All songs are composed, arranged and produced by Oganalp Canatan. Additional arrangements by Ozan Al­parslan, Jerry Outlaw and Onur Özkoç.